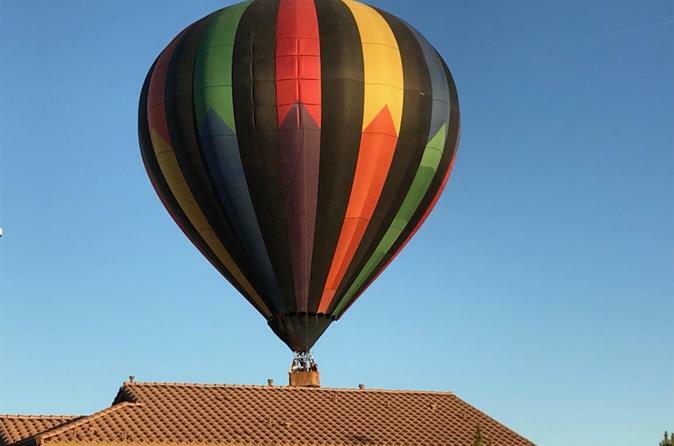 Come take to the sky in a beautiful hot air balloon in Las Vegas. With views of the beautiful colors the desert has to offer in the mornings sunlight, this private balloon flight for 2 will launch around sunrise. From high above the ground you will be able to see Red Rock Canyon, Mt Potosi, glimpses of the Las Vegas strip, and more. This private flight for two is a perfect way to enjoy the beautiful scenery of Las Vegas and surrounding desert landscape. This adventure begins early in the morning around sunrise. You'll meet up with the balloon crews who will be working to get the balloons ready to inflate. Once inflated the pilot will have you board and then you are off to see the sites of Las Vegas from high above. Your guide and pilot will be sure to point out different sites like Red Rock Canyon, Mt. Potosi and many more spectacular points of interest. Be sure to bring your camera to capture your personal adventure floating above the landscape mother nature has created. After the flight, you are welcome to participate with the crew in packing the balloon away and then enjoying a post flight toast to celebrate your journey and receive a personalized take home photo souvenir flight certificate before returning to the launch site.